IN SPORTS: Ed Kelly loves sports. Now, as semi-retiree, he heads the Ed Kelly Sports Program, Inc. and is sponsoring its 40th Annual Giant Awards Dinner. This event will be held on Monday, June 30, 2014 at the White Eagle Banquet Hall, 6839 N. Milwaukee Ave., Niles, IL. Cocktails at 6:30 p.m. Dinner at 7:15 p.m. Ticket donation: $100 each. If you are interested in attending this gala event make checks payable to The Ed Kelly Sports Program, 2224 West Lawrence Ave., Chicago, IL 60625. “This going to be our biggest Awards Dinner. It's will be a 'Who's Who”, said Kelly. 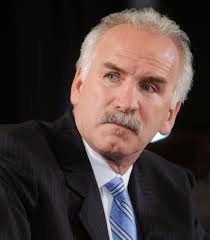 HONOREES will be: Joel Quenneville, Chicago Blackhawks – Head Coach [Muhammad Ali Athlete Award]; Dominic DiFrisco, Edelman P.R. Firm – Sr. Consultant [Irv Kupcinet Media Award]; Mike Brey, Notre Dame Men's Basketball – Head Coach [Ray Meyer Coach Award]; Tom Fitzgibbon, Sr., Twentieth Century Services, Inc.-President [Bill Hogan's Sr. Labor Award]; Luis A. Toledo, Midwest Moving and Storage, Inc.-President [Harry Kempf Business Award]; John Cullerton, Illinois State Senate – President [Jerry Gleason Achievement Award]; Marc Schulman, Eli's Cheesecake – Owner [ Marshall H. Smulson Humanitarian Award]. FOR MORE information on the 40th Annual Giant Awards Dinner, call Ed Kelly at 773/728-6300. A POWERHOUSE: Ed Kelly, 89, former Democratic Committeeman of the north side 47th Ward organization, is one of Chicago’s astute politicians. He still continues to be connected in both sports and in political circles. For years, Kelly's ward were known as the “Fighting 47” because of Eddie's strong leadership within the Cook County Democratic Organization. DURING HIS HEYDAY, because of Kelly’s strong leadership skills combined with the close alliance with Mayor Richard J. Daley; Eddie was appointed Superintendent of the Chicago Park District. As the Park Superintendent, he took great pride in caring for Chicago's parks. Eddie was passionate about promoting sports and had an outstanding boxing program for the kids. I’VE KNOWN EDDIE for a long time and I am honored to be a long-time friend of Ed Kelly. Eddie has always been a friend of our Hispanic community. As the Park Superintendent, Eddie was involved with both the Puerto Rican and Mexican communities. “I created the Mexican Museum in Harrison Park and the Puerto Rican Museum in Humboldt Park. In 1967, Kelly formed the first Hispanic Umpire Association at Lincoln Park and created soccer fields. Eddie is proud to let people know that he has four grandchildren that are half Mexican and two great-grandchildren. “Great kids,” said Kelly. IN 1982, I asked Ed Kelly to do two things;  create a small park on an empty lot at the corner of 28th St. & Trumbull Ave. in Little Village. Eddie said, OK, but a passive park. He said the corner lot was too small, but he could install some hobbyhorses and a couple of slides at that location. Today, the passive park is named “Miami Park” and kids are enjoying it. And,  to repair the chain link fence around Limas Park, 24th & Trumbull Ave. and to make other improvements. Again, Kelly got the job done. TWO YEARS later in 1984, I asked Park Supt. Ed Kelly for a swimming pool, with a dome, for Piotrowski Park in Little Village. Eddie said to me, “Augie, I can give you a pool but without a dome because a lack of money in our park budget. Do you still want it?” Of course, I said yes! Within the same year, Kelly had a pool built at Piotrowski Park. Years later, the Park District put a vinyl top over the pool. I had also asked Eddie to paint the park benches and remove graffiti at Piotrowski Park. Kelly had this work done immediately. TODAY, Ed Kelly is still busy helping people and giving recognition to individuals at his Annual Giant Awards Dinners who made a contribution in our society. Ed Kelly cared about our parks in Little Village, and I thanked him for it. SATURDAY, JUNE 7th—Joseph E. Gary Elementary, 3740 W. 31st St. Rummage Sale, 8 a.m. To 1 p.m. Vendor’s fee: $10. Questions, call 773/534-1455. MONDAY, JUNE 16th—Chinatown Business Luncheon Series featuring Gov. Pat Quinn, Phoenix Restaurant, 2131 S. Archer Ave., Chicago Chinatown. Ticket Price: Non-Members: $20. For more info call 312/328-0848. Purchase tickets at: HTTP://BPT.ME/702514. TUESDAY, JULY 15th—[Save the Date] 4th Annual Birthday Golf Outing, State Rep. “Lisa” Hernandez, 24th District.